Any person with an interest in vintage timepieces has more than likely come across a Super Compressor watch at some point or another – even if they did not know exactly what it was. 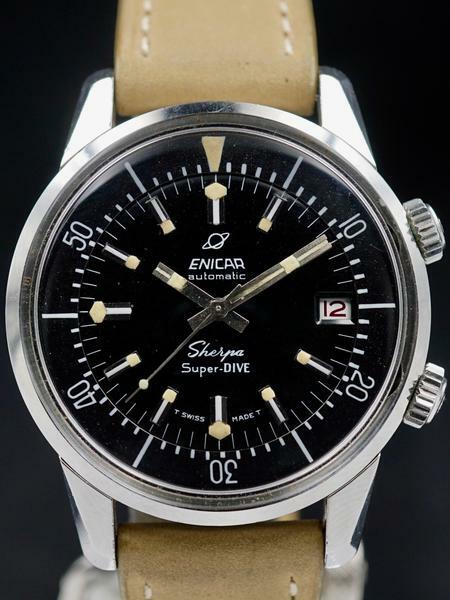 The “Super Compressor” term frequently gets misused to describe any watch with dual crowns and an internal rotating bezel; however “Super Compressor” is actually a trademarked name for a specific case design that was manufactured by Ervin Piquerez S.A. (EPSA) between the late 1950s and early 1970s. The design for the Super Compressor case was patented by EPSA in 1956, and relied on a simple but unique sealing method, which allowed the watch to become more watertight as it moved deeper below the surface. The case-backs on Super Compressor watches were made from multiple parts and often spring-loaded, which enabled them to move a little bit, and allowed the case-back to tighten against the middle case and rear gasket of the watch, as the surrounding pressure increased at greater depths. Although Super Compressors are almost an entire category of watches all to themselves and were manufactured in a variety of different configurations, the most famous “Super Compressor” watches were those that used twin crowns with a cross-hatch pattern on them (one located at 2 o’clock, the other at 4 o’clock), and internal, rotating, timing bezels. The crown positioned at the 4 o’clock location is used to wind the movement and set the time, while the crown at 2 o’clock is used to rotate the internal timing bezel. Having the timing bezel located below the crystal decreased the chances that it would accidently get knocked or moved out of place while in use underwater. Since EPSA produced cases for a number of different timepiece manufacturers, there are literally dozens of different “Super Compressor” watches that all have a similar overall design and shape. The list of brands that used EPSA Super Compressor cases is extensive, and a decent number of them are no longer still in existence. However, some of the most famous Super Compressor watches of all time were those that used EPSA’s classic, dual-crown, internal-bezel, case design. Such examples were produced by Jaeger-LeCoultre, Longines, Hamilton, Bulova, IWC, Girard-Perregaux, Universal Geneve, Wittnauer, Benrus, Enicar, Droz, and Precimax – just to name a few. Due to the use of third-party cases, many Super Compressor watches look very similar to one another, despite being made by very different manufacturers. The classic dual-crown design was typically produced in two sizes (36 mm and 42 mm), and many companies at the time manufactured watches in both case sizes. The larger variants are generally considered to be more sought-after than their smaller counterparts, and consequently often sell for higher prices. Additionally, due to the number of different brands that produced watches using EPSA’s Super Compressor cases, a surprising range of diversity exists among the various dials fitted to different examples, despite the fact that they all use (more-or-less) the exact same case. Given that such a diverse range of brands manufactured Super Compressor watches throughout the 1960s and 1970s, present-day prices for surviving examples can range dramatically, depending on the manufacturer and the overall condition of the watch. Certain well-worn examples from lesser-known brands can be found for well below the $1,000 price-point, while others, such as the Jaeger-LeCoultre Polaris can sell for tens of thousands of dollars when they surface at auction. Additionally, a few Super Compressor watches were even issued by branches of various nations’ militaries. The Polish Navy used Enicar Sherpa Super Dive watches with Super Compressor cases, while the Royal Australian Navy issued Super Compressors made by Droz to their divers. Naturally, these military-issued versions often carry a premium in price, and it is becoming increasingly common to find examples that have had fake military markings added to them in an unscrupulous attempt to give them some faux-provenance and justify a higher asking price. It should be noted, that because EPSA is no longer in existence as a company, certain genuine replacement parts for Super Compressor watches are not at all readily available. While new-old-stock parts do exist and can be found (with a bit of searching), purchasing a Super Compressor as a project watch may not be the most cost-effective decision unless you already have an idea of what the watch requires and whether or not you will be able to source the necessary components. Super Compressors make up a fascinating sub-genre of vintage dive watches that have a unique and interesting history that includes a number of very different manufacturers. Due to the impressive range of diversity that exists within the greater “Super Compressor” family of watches with EPSA cases, prices range dramatically, and there is quite literally a Super Compressor for every collector’s budget. Whether it is a lesser-known example from one of the more obscure brands, or the highly coveted, Jaeger-LeCoultre Polaris, a vintage Super Compressor dive watch is a worthwhile addition to any timepiece collection. Click here to shop our collection of Super Compressor watches.